Albuquerque Beer Scene: Tis the Season for...Saisons? A little bit of Portland-flavored weather here in Albuquerque today has already put me in a bad mood. I don't know how people in the northwest deal with it, and I also don't know if it's a good idea to just let the dog out to walk herself for a while and see if she comes home, but it sounds like a great idea right now. And while the chilly weather might have you thinking about opening something stout, I thought I'd let you know of a lighter option, should the mood strike you. 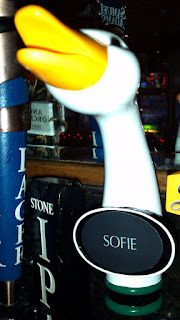 Horse and Angel Tavern, where the beer is always better than the service, has tapped the only keg of Goose Island Sofie in the state of NM. Sofie is a Saison blend with 20% aged in wine barrels and the addition of orange peel. Amarillo hops add citrus notes, and the wild yeast give the beer some tartness. Expect to pay about $6 for an 8 oz. pour. I give the service at Horse and Angel a hard time, but it's been a few years since I actually tried to get a drink there. I failed, but that doesn't mean the service is still poor. I'm willing to give them a shot if they keep putting interesting beers on tap (and I hear Goose Island Matilda is coming up next). We drink beer...that's how we deal with it.